Mahdi needs to return, back to Germany. Back to his Father and to his smaller brother, he has to take care of. 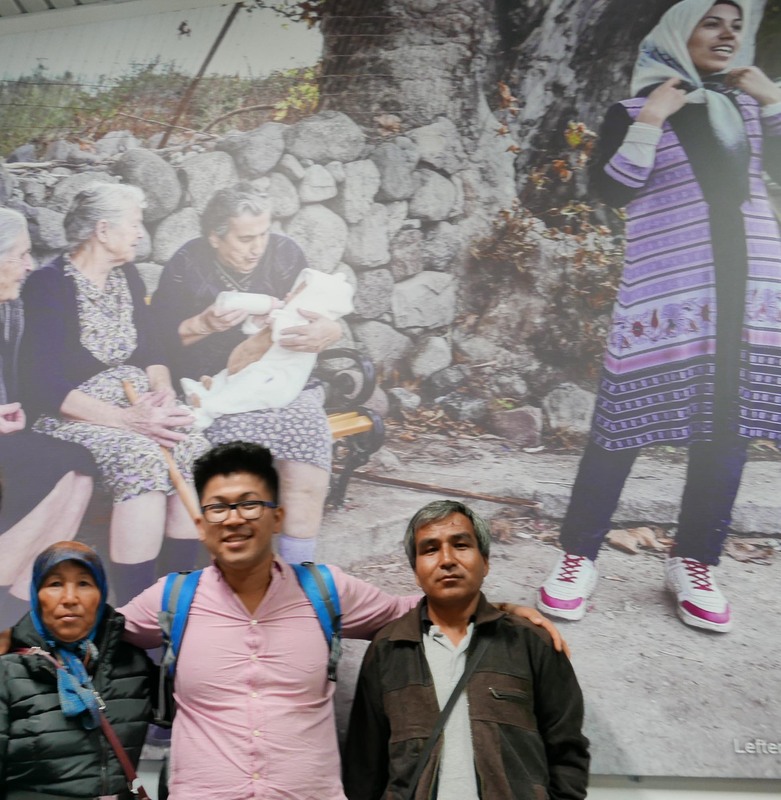 He leaves his mother on Lesvos, waiting for an unkown period of time for finally being together again when their family refunification will be accepted. Behind them a huge picture to advertise for the famous hospitality of the island. 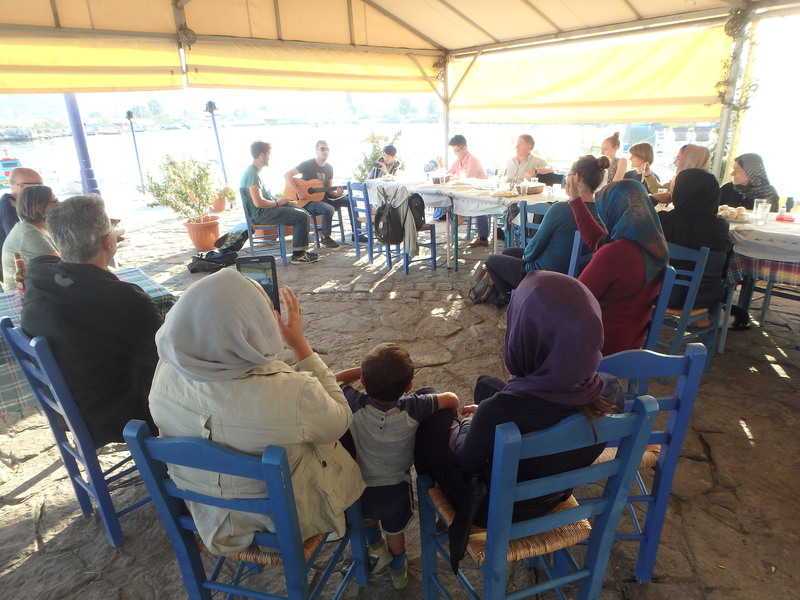 The inhabitants of Lesvos have been nominated for the Peace Nobel Price. Now hospitality is not the en vogue any more. Instead all newly arriving refugees will first be imprisoned and even after their release from the hot spot Moria they are not allowed to leave the island that became a big prison for refugees with this new policy. 6.000 people are waiting, some since many months. Waiting for the EU-policy to change. Waiting to finally manage to go and reach their final destinations. Mahdis mother belongs into the arms of her son. She should be part of his life that he has built up in Germany. She should not be stuck in here, waiting for months for the burocracy to finish their job and to finally allow her to reunify with her family. On Tuesday evening we met some social workers, lawyers, teachers and other people who work with minor refugees on the island. 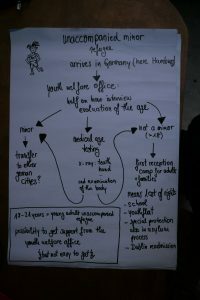 We started with an overview about the system in Germany: what happens when the unaccompanied minors arrive in Germany, the situation of the housing, the guardianships and the school system. The people were very interested, had a lot of questions and we started the discussion. They told us about the problems in Greece and we exchanged about the different possibilities and difficulties in both countries. 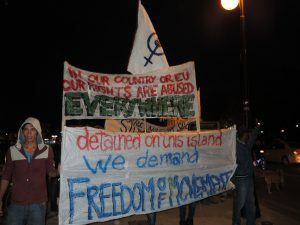 The situation in Greece, especially on the islands, changed a lot because many people arrived here and cannot move on. But when they left their countries they wanted to live in better conditions, planned to go to other countries for example to join their families and it’s hard for them to see that’s impossible to move on now. The first reception for the unaccompanied minors is in the prison in Moria. They are only allowed to leave the prison a few hours per week. They have to stay there until a place in a youth shelter is found. But the problem is that there are not enough places for all of them so they are imprisoned often for months. 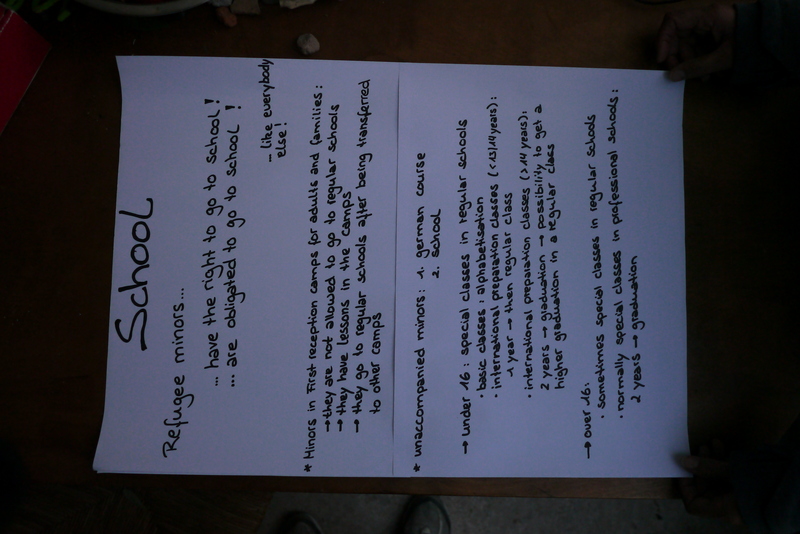 Also the school situation is very complicated. Most of the minors don’t go to school. In some cases where they tried to send children to school there were also protests from some local parents against it. 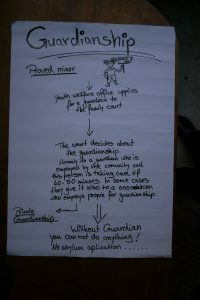 The guardianships for all the minors on the island are in the hand of three judges/ prosecutors. The minors never see their guardians and the social workers need to invest a lot of time to get signatures for sport activities, medical treatments and so on. They don’t get a general authorisation which would make the daily work a lot easier. In the cases where a minor has for example an uncle in Athens either the prosecutor has to agree or the uncle has to pay a fee of 200 Euro to get the private guardianship. 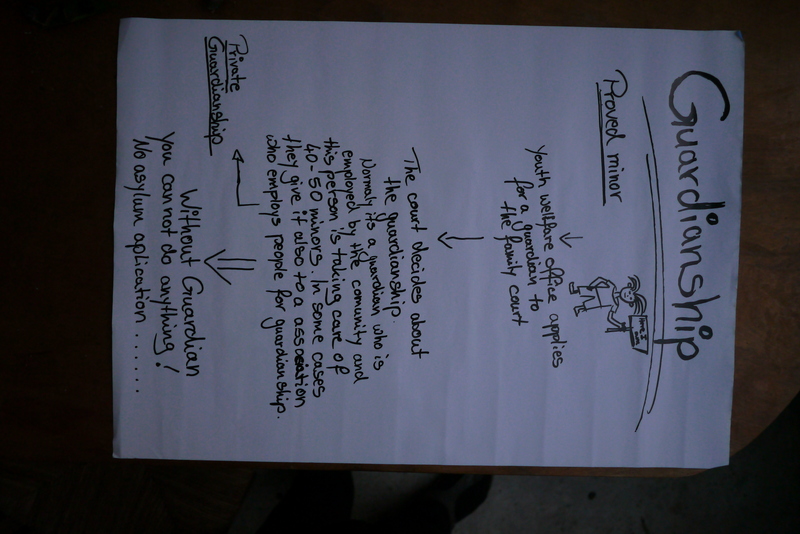 Due to the high amount of guardianships one prosecutor has, it’s not so easy to get the agreement. Naturally we also talked about family reunification and exchanged about the experiences. Because to the lack of information a lot of people in Germany are afraid of bad consequences in their asylum procedure if they do family reunification. 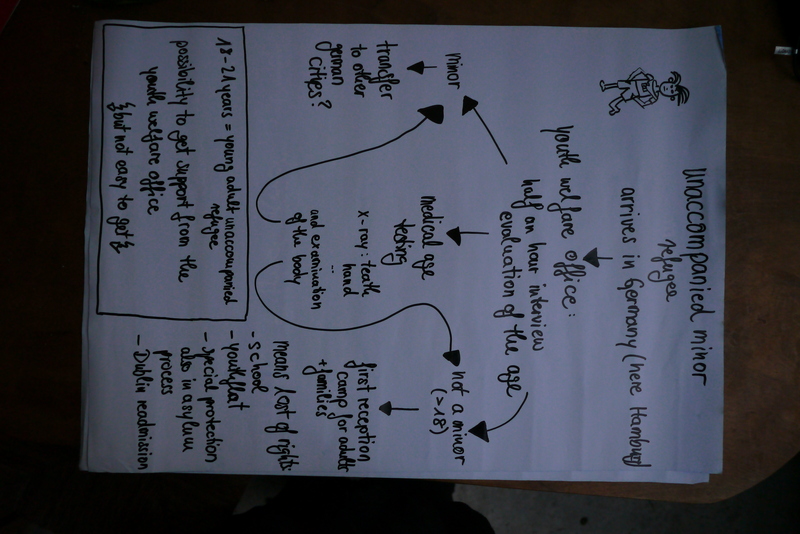 The communication with the lawyers, social workers and family members in Germany is also often complicated. We all could profit a lot from this meeting. 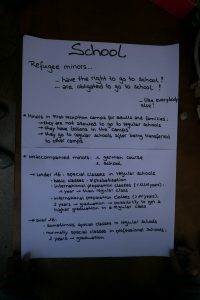 We are planning to keep in contact with the common wish to support the minors in their arrival in Europe. In October we, Welcome to Europe (W2EU) and Youth Without Borders, return again to Lesvos to the place of our first encounters, our first arrivals to Europe, the place that reflects the current EU border regime like no other. Many things have changed since our last “Journey back to the Border”: the infamous EU-Turkey deal has “helped” to decrease the numbers of arrivals of boats drastically compared to “the long summer of migration 2015”. Moria has been transformed into a “hotspot” with an immense number of NGOs providing their visions of humanitarian and financial aid. The next week we want to inform on this blog about our actions on the island. It is especially for all those from our group who were not able to join the “Journey back to the Border” of this year. You are here with us in our thoughts!! After days of preparation we started on Wednesday with visiting our Memorial in Thermi that we set up in 2013. The memorial commemorates 27 people that drowned in 2012 representing all the people that lost their lives at the border of Fortress Europe. We wanted to renew the stone to resist the harsh weather conditions of the Sea. First, we cleaned the place and met with local people to discuss the materials, design and ways how to maintain this place in the future. Then, we planned a ceremony that we want to hold on Monday to commemorate the ongoing death in the Mediterranean. After Thermi we went to Moria to see how the place has changed. Approaching the prison we couldn’t believe our eyes: It was hard to find a parking space with very long lines of parked cars around the entrance. Mostly they had signs of car rentals or NGOs. 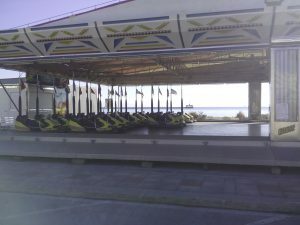 It was very clear that the owners of the cars are somehow working inside the prison – as you can’t enter without a permit. Moria has been further “fortified” with fences and barbed wire, more containers have been built to increase the number of detainees. It looks like, it sounds like, it tastes like a prison even though some people can partly go out after being registered. There was no sign of the recent fire. The flames have been extinguished with daily business taking over. Around the entrance little businesses have emerged, a taxi line waiting to bring people to the city and a handful of canteens where you can buy food or drinks with the jolly company of civil cops or other mysterious figures… Not a good place to get in contact with people. Then, we went to Kara Tepe, the former open camp for Syrians and Iraqis. It is now for people of mixed nationalities. 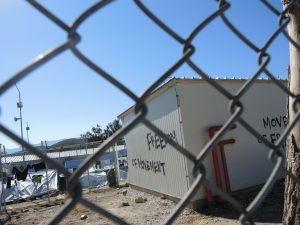 We had the impression that there are more families and women than in Moria. Again, this place was full of NGOs that were going in and out. We sat with Mahdi, his mother Fatima and her friends outside. 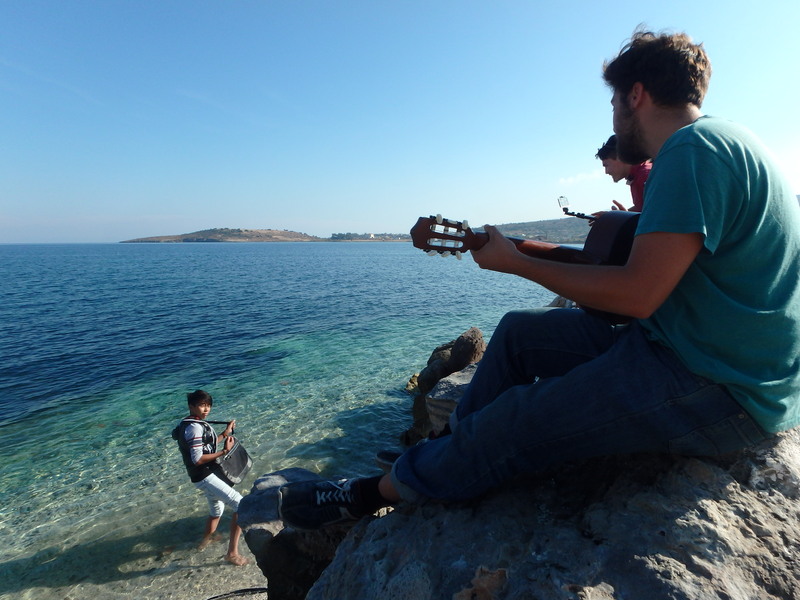 Mahdi is a friend who lived for many years in Villa Azadi in Agiassos on Lesvos as a minor. He has arrived to Germany (six years ago), learned the “Hessen” accent of German and would like to marry his girlfriend there. For this he wants his mother living at his side – which is why he came to Mytilini to organize and speed up the family reunification procedure. It is a scandal that Fatima is in Kara Tepe since four months being sick while her whole family is in Germany waiting for her. She is one of thousands of refugees who are stuck in Greece due to policies following the EU-Turkey deal. 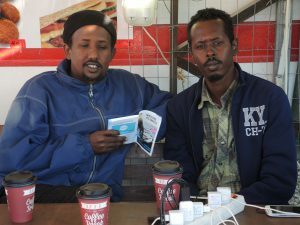 After this we went down to the beach where the No Border Kitchen is currently located after having been evicted several times and have again an ultimatum until the 1st November to leave their “social centre”. Slowly people from our group arrived this day and dropped in. Also there arrived Hassanjan to visit his small brother whom he hadn’t seen for four years. Among us there are two people here to speed up their family reunification. It shows again that we can make things short while administration takes way too long!! In the evening we all sat down and ate in a Taverna to celebrate that we are together again even though we miss all those who were not able to come this year. In the night we went to visit people from ERCI (European Rescue Committee International) on their night shifts. Next to the airport we found two volunteers sitting and watching the sea for new arriving boats. We made a bonfire and talked about their and our work also with Watch the Med Alarm Phone. ERCI has two boats to assist in rescue operations, they work in close cooperation with the Greek Coastguard and Frontex. On Thursday we went in the morning to accompany Siniparxis on their excursion with unaccompanied minors from Moria. 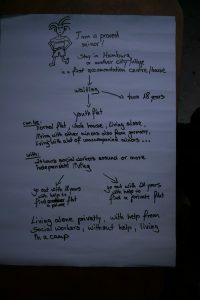 Siniparxis is a long-existing local solidarity network. They organise this kind of excursion since half a year every week to give the imprisoned youth the chance to get away from prison for a few hours. As it was an excursion from prison there were also “social workers”/ guards with us. This was strange for us. They were having a lot of fun even though there were still in a context of prison. As the place was directly at the seaside you could see Turkey in a clear view which made the whole situation even more absurd. From the “Luna Park” the youngsters were transferred to a place where they could watch a local master of handmade pottery doing his job. In the end we went to a café in Kagianni, a village with a splendid view over Mytilini and on the side towards Turkey where everyone took a lot of obligatory selfies. 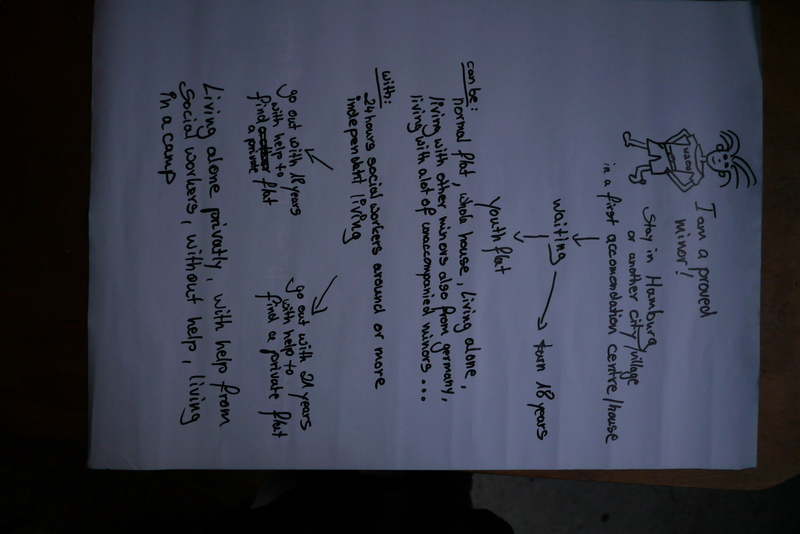 The last two weeks we talked with the young people about their dreams and wishes for their future professions. They made drawings out of this which we aim to make an exhibition out of them. In the end, we shared our thoughts that we understand that now it is very difficult to think about their future but the situation they are in will not last forever. For this it was very good that Hassanjan was there, too and who has been in their situation some years ago and lives in Germany now. It was cool when everyone realized that they knew Hassanjan’s little brother. Finally, everyone departed back to prison and left us behind with mixed feelings. After this we welcomed Reimer and Ömer, a Alarmphone member from Izmir (Turkey), and had a plannery in Café Pi. In the evening we ate together and went to dance in Bobiras to the DJ-music of our friend Leonidas from the band Alcalica. On Friday some of us went with the second group of minors from Moria to do the trip like on Thursday. Afterwards we had planned a farewell party in Panagiouda for Mahdi and his mother Fatima. Because of the extremely slow Greek bureaucracy, Fatima has already waited about two months to get an appointment to apply for family reunification even though her whole family is in Germany. 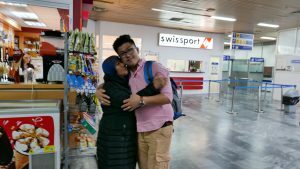 Mahdi, her truly awesome son, had come from Hessen (Germany) to visit her for two weeks and to help organizing the legal process for family reunification. In Kara Tepe Fatima has met other Afghan women and appears to be very warm-heartingly socializing. With about 10 afghan women and their children who left their husbands at the gate of Kara Tepe we went to eat fish in Panagiouda. We sang, played guitar, danced with the children and made a nice farewell party for Mahdi and his mother. To their future reunification in Germany, so they can be together for the future marriage of Mahdi!! We all exchanged contacts and talked how to be in touch to speed up the legal procedures. It was hard to say goodbye but the evening left us with hope that we all could meet in a better situation in Germany or elsewhere. On Saturday we went to the beach to swim as we were brave enough to resist the cold water. 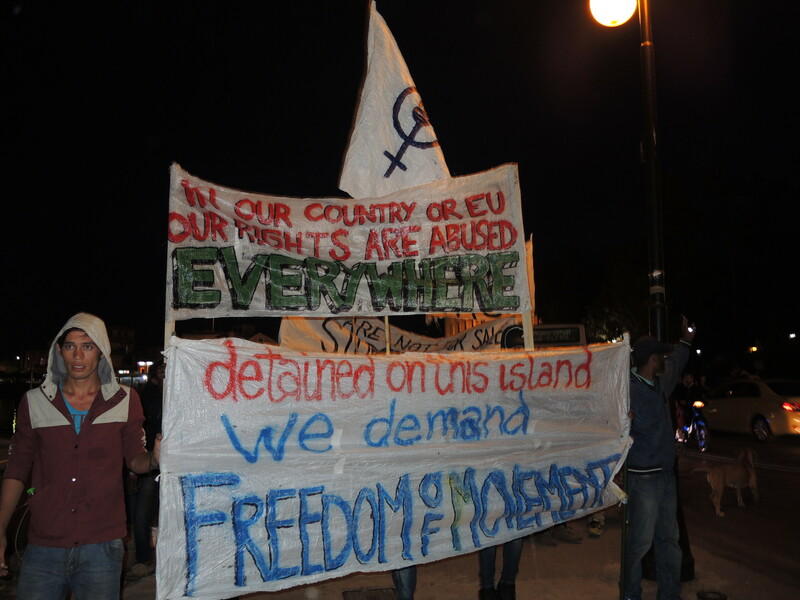 In the evening we joined the weekly demonstration against the current EU policies and especially the situation in Moria (every Saturday evening at 6 pm) supported by people from the No Border Kitchen. Approximately a hundred people crossed the harbour of Mytilini two times, shouting and demanding the end of the EU-Turkey deal and open borders. Later we cooked different dishes with pumpkin and sat together to eat. Irem and Valerio who had joined us from Izmir (Turkey) talked to us about the current complex and hard situation in Turkey after the EU-Turkey deal. It was a warm evening and it was very nice to exchange while sitting together.